Fipronil is a broad-spectrum insecticide in the phenylpyrazole chemical group. It acts on the nervous system by blocking the tiny gates on the nerve cell that control the sending of the nerve's signal. This causes the nerve to keep firing and eventually the nervous system stops working. Fipronil is used in agricultural and residential settings, including pet flea products. What are some products that contain fipronil? What are some signs and symptoms from a brief exposure to fipronil? What happens to fipronil when it enter the body? Is fipronil likely to contribute to the development of cancer? Has anyone studied non-cancer effects from long-term exposure to fipronil? Are children more sensitive to fipronil than adults? 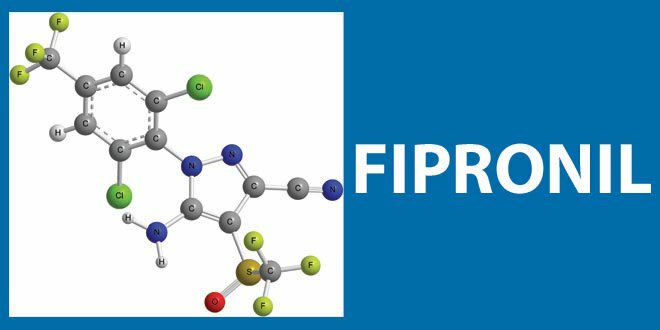 What happens to fipronil in the environment? Can fipronil affect birds, fish, and other wildlife? If you have questions about fipronil, or any pesticide-related topic, please call NPIC at 1-800-858-7378 (8:00am - 12:00pm PST), or email at npic@ace.orst.edu.